The Heritage held the first only tri-sanctioned tournament endorsed by the European, Sunshine and Asian Tour. The Heritage golf course is a real gem. The course has been built on a very old sugar estate in the south of Mauritius. The Heritage is the first design of Peter Matkovich in Mauritius. As this particular golf course was and is a success, Peter Matkovich is now building his third golf course in Mauritius. 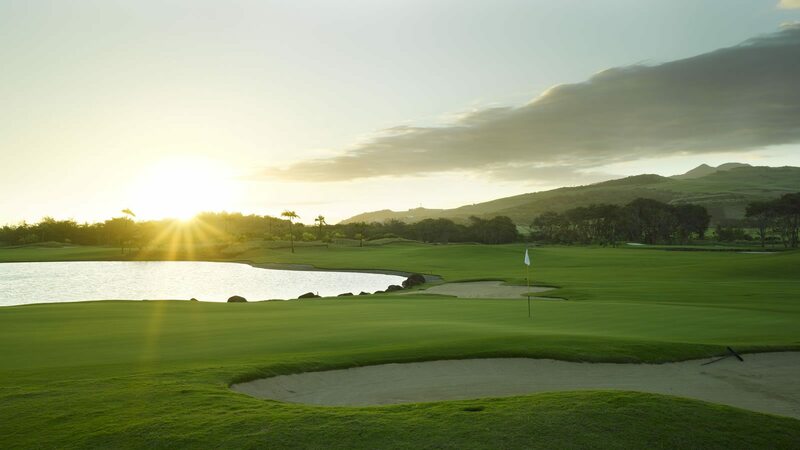 The perfect combination of the lakes, ponds, bunkers, and the breathtaking views of the south of Mauritius makes the Heritage a must play golf course. The fairways are large and therefore remain playable for all of us golfers. To also note that the Heritage Golf Course has held the first and only tri-sanctioned golf tournament in 2015 endorsed by the European, Sunshine and Asian Tour and since then hold this event every two years with the Anahita, Four Seasons. Held the first and only tri-sanctioned golf tournament endorsed by the Asian, Sunshine and European Tours. A very diverse golf course, perfectly maintained. Currently they have 18 holes, but an additional 9/18 holes are under construction to be expected in 2019. Very nice staff, well equipped pro-shop. The restaurant is serving a very nice lunch. Great course. Superb condition. Testing holes. Wonderful views which you must remember to look at!! Cannot fault the caddy staff. Very friendly as are the bar/restaurant staff. Can’t wait to go back in 2018. In total we played 11 rounds on this course. The first round was challenging. And so it continued. The course was well maintained and in good condition every day, although there were many players. Very nice restaurant, with good food and nice service. This is a really lovely golf course with some nicely modeled and challenging holes. It is beautifully manicured. The course has a challenging mix of holes with a nice dose of water and some really tricky greens. It will not fail to impress. Excellent time at Heritage! Great location, golf course in excellent condition and really enjoyed my time playing there! The Heritage Golf Course is a special one. The manicured fairways and greens, panoramic views, and peaceful atmosphere makes it all together a very pleasant golf course. The fairways may be large but yet the challenge to make a good shot remains. Beware the greens a very fast. I would strongly recommend the use of a golf cart, as it can be quite steep on some holes unless you are very fit. In anyway, it is a must play golf course. The Heritage golf course is truly a lovely course! Long hitters will love this course, as it is world class. Beware of holes Nos. 4 and 17, where Par is worth gold. A very well defended course with water hazards, deep bunkers, and rolling greens; it is the must-experience course. Book any golf course in Mauritius with few steps. Would you like a golf cart? Based on our exclusive agreement with the respective golf courses, you have high chances to get availability at the requested tee time. However, your enquiry remains subject to availability. An email of confirmation will be sent to you not exceeding 24hrs. Every element of Heritage Le Telfair, from the four poster bed, to the wooden floors or freestanding bath is designed for the utmost in luxury and comfort. A golf pass allows you to book 4 rounds of golf on the finest 18 hole courses, 40% cheaper than the regular rates. Only available from May to September 2016.